For snow kiting most riders wear the same harness as they do for kiteboarding. 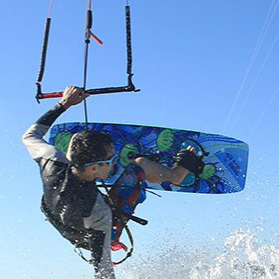 The waist harness is the most popular harness among kiters. The waist harness offers the largest range of motion and has less restriction for movement. If you are looking to boast air and master a number of tricks, the waist harness is the way to go. The seat harness is best for riders who just like to cruise around, or those who may have some back issues, or for heavier riders. The seat harness can also be better for people new to the sport because it lowers the center of gravity of the pull of the kite. If you have any questions, call us. We would be happy to help.